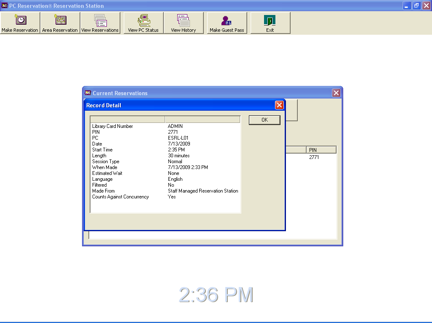 Envisionware Staff Managed PC Reservation: This is the main interface that the staff will use to make reservations for their patrons. This will be installed on Circ desk and staff PCs that need to make Patron reservations. →Find a PC in the following Area is where you have your branch focused by default but other Areas may be selected from the drop down box. →To make a custom length Session length, check the Override Session Length box and select the length of the session. →If a patron would like to use a specific computer you may check Reserve a Specific PC and find the computer in the drop down list that you need. →Internet Filtering is on by default so if a Patron would like to have a session unfiltered they must specify this when they make the reservation. If the Patron is in a session at the moment, their work will need to be saved so they can have a new reservation made that is unfiltered. →PINs aren't used so you can ignore this randomly generated number. →The PC this reservation is made for is ESRL-L01, which is computer one in the ESRL Area for example. → The date and time are specified here for the session. 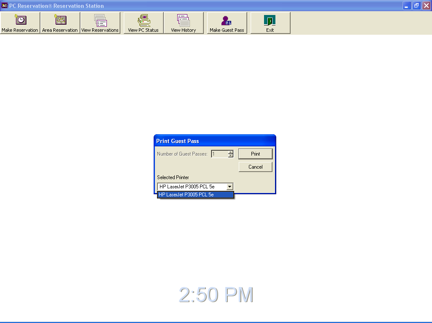 →This displays the time allowed for the day on that card. →If there is a wait time it will be displayed as Wait Time: and the length of the wait. This shows that the people that have reservations but have not sat down and entered their information yet. When they have done so, they will be removed from this list. 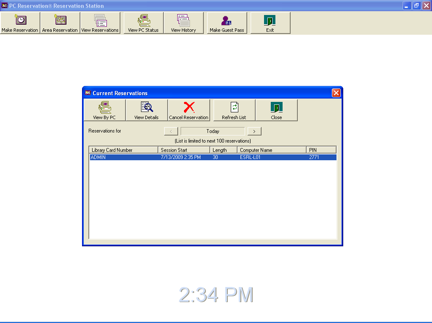 After the Patron has entered their information to begin their session their computer will be represented with a blue bar on the time line and their name will be removed from the View Reservations listing. If you click View Details you will get the information about the Patron who is about to enter their information. To Cancel a reservation before the patron has entered their information just click the Patron's card number and click Cancel Reservation. Here you can Send Messages, End the Session or Extend a Patron's time. If a Patron locks their computer and leaves or forgets their password you may unlock them using the Unlock button. The Details button gives the same information you saw previously for Patron Details. Refresh updates the listing of computers and their status. NOTE: Unlike "Refresh" in Sam (Which is now EXTEND TIME), this only updates the list of computers and their status. 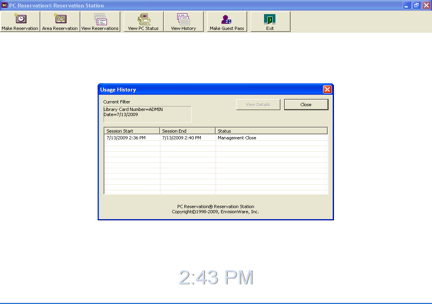 When you click View History a window will pop up and display all the sessions that exist on that Library Card Number or guest pass for that days usage. 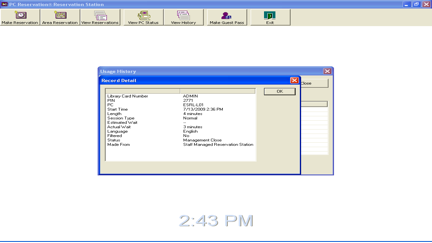 Clicking View Details on any particular session will give you the details of only that session. This can be done for each session in the list. Make Guest Pass: To make a guest pass, click Make Guest Pass then be sure to select the desired printer and number of passes and click Print to receive them. NOTE: Guest Passes are different than they were in Sam. You CANNOT put money on guest passes because this left too many open balances. Guest passes only work for one day and for one session. Guest pass numbers are generated on a USE basis. For example card number: Guestxxxxxxx01 and Guestxxxxxxx02 are printed out at Branch A and card 01 was used immediately. The next Guest card to be used will be 02. If Branch B prints a guest pass, they may get Guestxxxxxxx02 and use it before Branch A. In that case, Branch A's Guestxxxxxxx02 will no work for a patron anymore. If this occurs, just reprint another guest pass and this should resolve the issue.